Today I’m going to take a bit of a break from writing about Orny to discuss Apple’s APIs for Twitter integration, newly introduced in the iOS 5 SDK. Specifically, we’re going to cover the Twitter framework (an elaboration of NSHTTPRequest), the Accounts framework (a central framework and daemon for the storage and management of account credentials) and we’ll briefly touch on NSJSONSerialization, Apple’s previously private (and now public) implementation of a JSON-to-Foundation-Object parser (it also works the other way ‘round). I’m going to assume that you’ve read our previous iOS Tutorials and know how to start a new project. Things are a little different in the new version of Xcode, but not so different that past instructions are too badly out of date. Create a new project, using the following images for clues. For those without images we’re using the Single View Application template, adding a Class Prefix of “TWAPIExample”, the Device Family is “Universal” and all three checkboxes are ticked, because we are using Storyboard, Automatic Reference Counting and we want to Include Unit Tests. At the time of writing, the documentation on some of these Frameworks is still in its early days. I’ve done my best to piece things together from the API documentation and present a coherent overview here. You should, however, definitely review Apple’s documentation before you use any of this code (as it may have changed by the time you read this document). To begin with, we’ll do a simple request to get some results off Twitter’s public Firehose. This does not require authentication. We’re going to grab a single public tweet, and pop it in a UILabel on the screen when the app loads. Nothing fancy. Before we can use the TWRequest class, we need to add the Framework to our project. If you’re not familiar with Frameworks, they’re optional sections of the iOS API that your application can include at compile time. 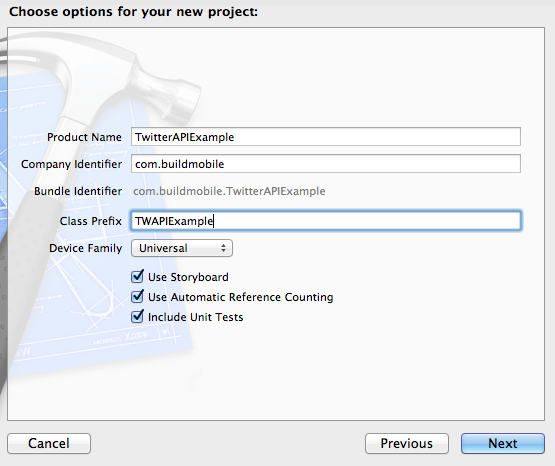 Adding the Framework lets Xcode know that you want to use these features in your app. Select your project, and scroll down to the Linked Frameworks and Libraries section (under the Summary heading). Click the plus arrow, and scroll down until you find ‘Twitter.framework’. Add it. (At the time of writing, I found the text-input search box at the top of this list failed to work. YMMV; scroll manually if in doubt). The first thing we need to do is specify the URL we’re going to hit to grab the data. We’re provided some excellent API documentation, for example the full Twitter REST API Resources list. We’re going to use the REST API for this application. Also on offer is a Twitter Streaming API for high-volume, near-realtime access to voluminous Twitter data, well beyond the scope of what we want to achieve in this example. 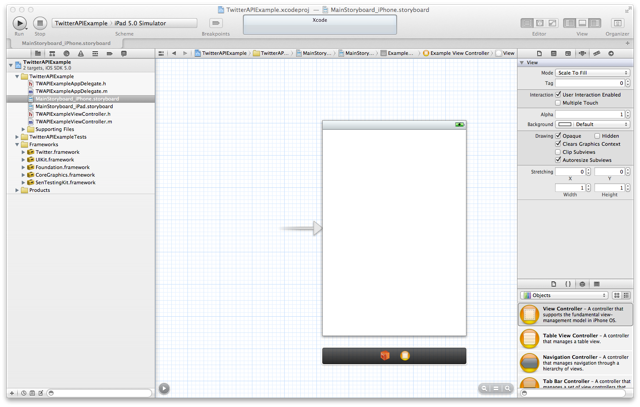 In the latest version of Xcode, we now have access to two Storyboards. The Storyboard replaces the previous panoply of NIB files present in an iOS project. 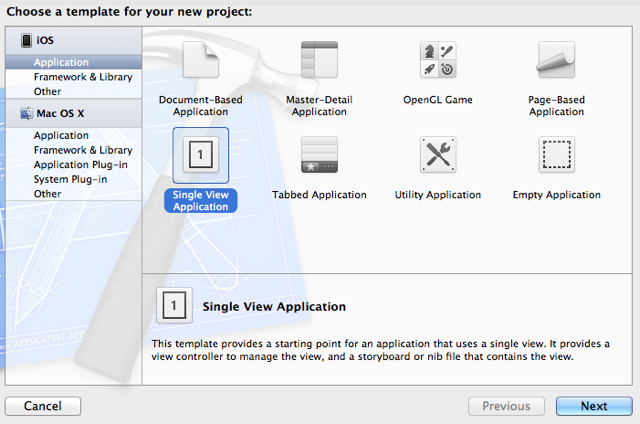 Now all Views appear on the one Storyboard, and are attached to their respective ViewControllers. You can much more easily get a feel for how your application hangs together from the Storyboard, though it can become more cluttered. Click the Storyboard for your iPhone UI (MainStoryboard_iPhone.storyboard) and select the View. 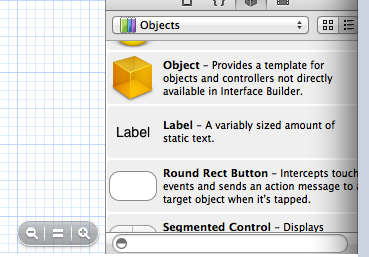 Drag and drop a Label into the center of the View, select the Label, and navigate to its properties. Get through the following three screenshots and we’ll meet at the bottom to change the properties. Next, go across to the ‘View Properties’ tab for your Label. You’ll want to resize the Label to be nice and big, so it can display an entire Tweet. Grab the edges and expand it to fill the available space. You’ll also want to make it a multi-line label, so in the field called Lines (see the screenshots, above) increase the number to 3 or 4. Repeat the above steps for your iPad Storyboard ensuring sure to use the same tag! We’ll add a message, getTweet, to our ViewController object. First, we need to add the Twitter API headers to our ViewController’s header class TWAPIExampleViewController.h around line 10. We’ll specify the functions and methods we need in the header while we’re here, around line 13. Now, let’s define the function we’ll use to get the tweet, just before the @end of our implementation in TWAPIExampleViewController.m. // so we'll output a bunch of debug information. Whew, busy function! We could probably refactor this substantially by decomposing it and moving much functionality to another class, but for the moment we’ll leave it as-is. Consider this refactoring an exercise for the reader, homework if you will. Finally, we set the text attribute of self.tweetLabel… oh, but we haven’t a handle to that yet, have we? We need to grab ahold of our Label, and also invoke our getTweet message. We’ll do this in our ViewController’s viewDidLoad message, which defines actions to be taken once the View has been loaded from a NIB file. Remember how we set a tag on our Label in the View earlier? We now use this tag to refer to that View component and take ahold of it, so we can modify it. If you compile and run the program, it should pull a single Tweet off Twitter’s public Firehose. Who knows where it will be from, or what language it will be in! ?